Vodafone will be offering the fastest mobile broadband speeds seen in the UK so far when it upgrades its 3G mobile broadband network this autumn. Vodafone is to upgrade its existing 3G mobile broadband network to deliver higher speed internet surfing, data downloading and file uploading. The upgraded Vodafone 3G broadband service will support download speeds of up to 7.2Mbps, initially for laptop users. Vodafone is launching a new USB Modem and two ExpressCard data cards to enable laptop users to get high-speed data on the move. The high-speed data service is initially being rolled out in Central London and at major airports in the UK. It'll offer typical download speeds of 1.7Mbps to 5.5Mbps - up to 14 times faster than standard 3G. At the same time, Vodafone will also be introducing HSUPA (High Speed Uplink Packet Access) high-speed upload technology for the first time, increasing upload speeds to up to 1.44Mbps. That's 10 times faster than current 3G upload rates. This will improve upload times for mobile workers who need to send large files on the move when there's no Wi-Fi available. Vodafone is releasing three new 3G mobile broadband devices that support the higher 7.2Mbps data rates. 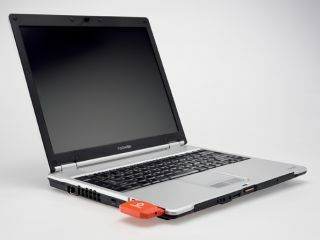 The USB Modem 7.2 and one of the ExpressCards data cards are plug-and-go devices, while the other ExpressCard is designed for corporate users. Prices start at £49 with an 18-month contract for both devices. More details are available from Vodafone's online store.